If you guys remember, a while back we featured this awesome working recreation of Genji’s sword from Overwatch done by the guys at Man at Arms: Reforged. 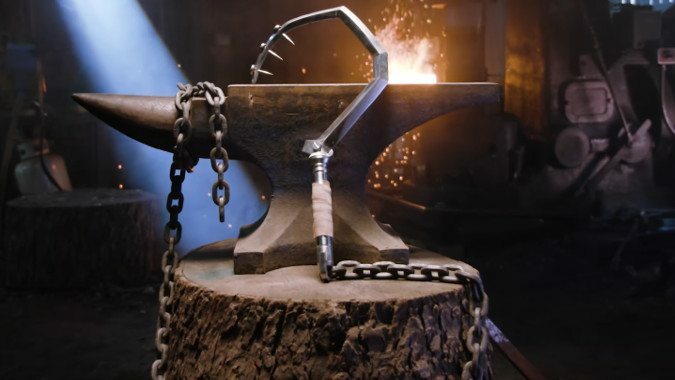 If you’re not familiar with the web series, Man at Arms: Reforged showcases talented blacksmiths and craftspeople making real working replicas of weapons from games, anime, and even movies. They’ve done stuff from WoW, League of Legends, and Overwatch — that last of which their latest recreation, a working recreation of Roadhog’s infamous hook, hails from. One of the reasons I love watching this show is getting to see how something so fanciful and unwieldy could be created in the first place. Frankly, I think the crew here put in a lot more time and care than Roadhog himself would have, but getting to see the hook take shape and then watching it get used in the demo is always a blast. I’m a little disappointed that they didn’t set up a dummy and try to yank it over with the hook, but that’s a minor quibble compared to how awesome I think Lady Roadhog is at the end. It’s possibly my favorite cosplay in a long time. This was a fun one. I hope they get ambitious and do Reinhardt’s hammer next.